The notice came overnight: Get ready to respond to a nuclear disaster situation in Southwest Florida. Be ready to deploy for a week. So early Friday morning, more than 300 20th Engineer Brigade soldiers prepped convoys. 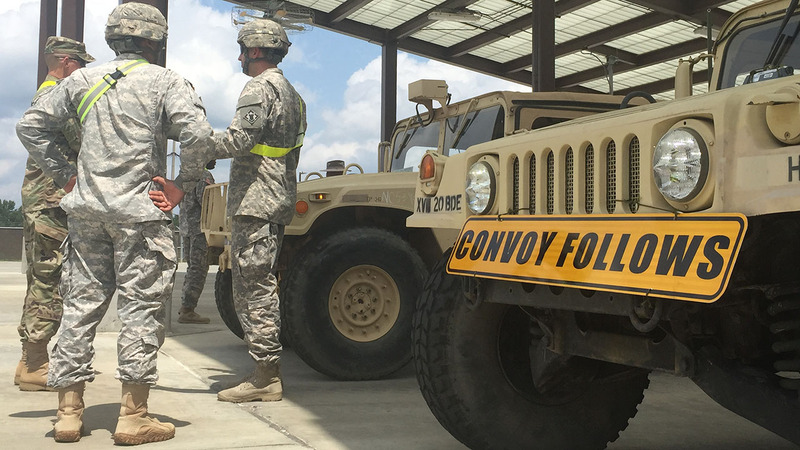 Over the next five days they will join more than 400 additional troops in an Emergency Deployment Readiness Exercise. The 18th Airborne Corps soldiers have a focus. "We're specially trained and equipped for chemical, biological, radiological, and nuclear hazards," said Colonel Jayson C. Gilberti, the Brigade's commander. "It's absolutely essential to ensure trained and ready forces," Gilberti said. "I don't believe we're never 'not ready.' You can never be ready enough." Gilberti knows about that call all too well. He was among the local soldiers who deployed to Louisiana ten years ago, in response to Hurricane Katrina. "It's about Americans helping Americans," Gilberti said. "And there's no greater feeling or rewarding, whether you're wearing this uniform as a part of the active Corps, the Guard or the Reserve-it's one team as we're helping one another out." "The outpouring of support that we received down in Katrina....if this were to happen in America (again), whether it be in Sandy or some sort of other natural disaster, it's just a tremendous good feeling to help Americans out," he continued. Among the 600 soldiers involved in this joint exercise, there are units from Fort Gordon and Fort Stewart, G.A., as well as Fort Hood, Texas.